- 3 BR, 3.5 BA Home with 2500+ sq. ft.
Destin Resort Property, Silver Shells-St. Thomas condo. Glass windows and doors surround the entire living area with 12 foot ceilings – providing amazing views of the Gulf of Mexico. This comfortable residence include a wet-bar, dining-room and a spacious living-room. The Master Bedroom has walk-in closets and a bathroom with double vanities, walk-in-shower and a jetted-tub!, The guest bedrooms are spacious with bright/beach decor. This home has 3.5 baths – the views of the Gulf are simply spectacular and the convenience of being steps away from St. Thomas’ own private, 7,500 sq. ft. pool and the walkway to the beach makes this condo feel like you’re living at your own private residence. This resort condominium home includes deeded covered-parking garage, or you can always park steps away from the entry door. There is also additional storage for your beach gear on the garage level. The outdoor BBQ grills are conveniently located close to property, making it ideal for entertaining family & friends. St. Thomas is a rental restricted building at Silver Shells Condominium and offers the finest in resort living – experience the best in outdoor coastal living, come see this stunning Destin home… Destin Florida Condo at Silver Shells Resort"
Destin Florida, located on Emerald Coast, has a subtropical climate and beautiful, emerald waters. The local beaches here have very fine, soft sand, great for beach-combing building sand castles, etc. 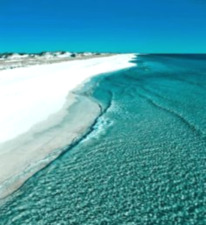 The Destin Florida beaches are recognized as being among the most beautiful in the world. Destin is also know as “The World’s Luckiest Fishing Village” - offering world-class deep-sea fishing; this family-vacation destination also includes an array of outdoor recreational activities, shopping and unique dining.